When creating an identity for your business, the best place to start is deciding upon your corporate values. Usually a set of words or phrases, your company values should be an accurate reflection of who you are as a business; they should encapsulate your ethos and your people. Ask yourself the following questions: What do you want your business to represent? What key behaviours or principles do you want your employees to support? What are your company objectives? No matter what your values are, they should be unique to your business, aligned to your goals and matched to your people. On top of that, they should be visible so that clients, potential customers and, most importantly, your employees know and understand your company’s identity. Values shape company culture and underpin the behaviour of your people, so they’re also helpful for potential future employees as they can determine whether they are matched to your business. The process of deciding and implementing company values should be carefully considered, and we know this first-hand. A couple of years ago, peoplevalue had grown to a size where it had become difficult for us to effectively capture and communicate our ethos. So, to help our business develop, we embarked on our very own quest to solidify our values and embed them into our company culture. We hope this provides you with an interesting example and gives you a better flavour of how we like to do things here at peoplevalue. 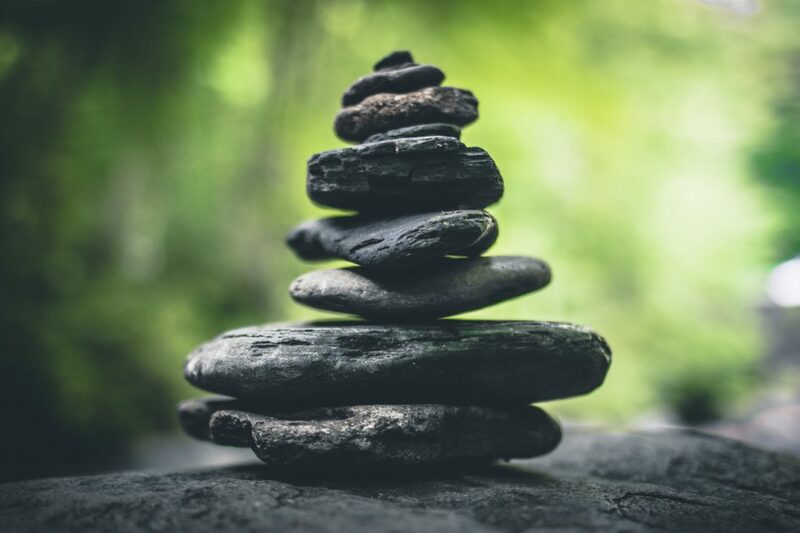 Values need to be aligned to company culture in order for them to be unique, meaningful to employees and so that they can be seamlessly integrated into the business. So, rather than come up with a set of values that we liked and then shaping our company to fit around them, it was crucial to us that our values reflected how we were already perceived. We wanted them to epitomise who we are. To capture this information, we asked our customers, partners and, most importantly, our employees what words they associated with peoplevalue. These words were the key. They gave us the best idea of what peoplevalue means to others, both internally and externally. From our various avenues of inquiry, we gathered a collection of key words which we then collated to form a ‘master list’ of values. This list formed the basis of various internal discussions around our values which looked at the most popular words and assessed whether they were aligned to our ethos, our people, and our strategic goal. Once we decided upon our final set of words, we communicated them out across the business for review and feedback. Had we got it right? Listening to our employees’ feedback was essential because we wanted these words – our values – to be a reflection of our people, and something that they personally felt aligned to. With our values decided, we needed to create a way of effectively illustrating them so they could be easily identified and understood by clients and potential customers on our website, and by our employees on our internal platform, The Hub. We drafted some short and snappy subtext to explain what each value meant to us, and our fantastic in-house design team got to work creating icons for each value. For us, there was no point simply having a set of values in place if we weren’t going to fully integrate them into the structure of our business. Remember, values should form a framework of key behaviours and standards that everyone should support and actively embody in their different job roles. The best way for us to embed our values was to tie them in with our reward and recognition strategy, so everyone at peoplevalue could say “thank you” and “well done” to each other for demonstrating and living the values. Again, our peoples’ opinion mattered here, so we set up a competition for employees to name our reward and recognition scheme. After many interesting entries and long discussions, we decided upon the name and Limelight was born. Limelight was given a slightly different look and feel to differentiate it from our corporate brand. 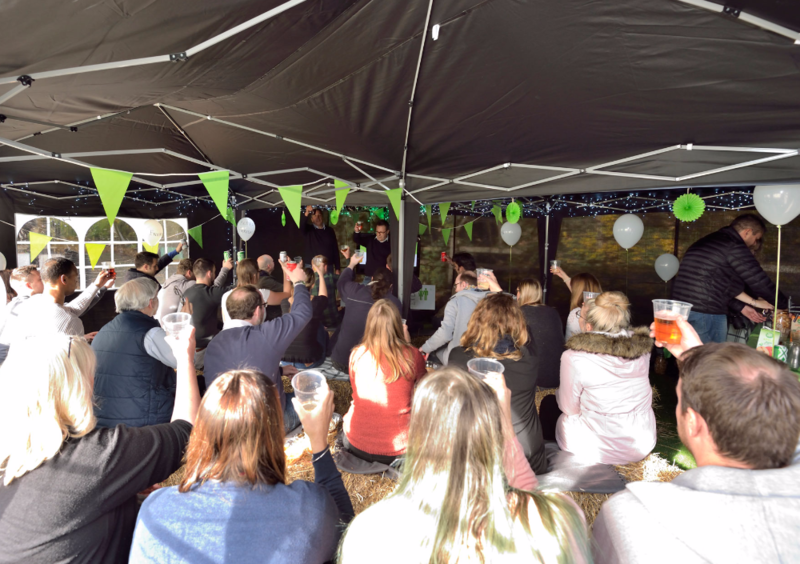 To mark the official launch of our values and celebrate the start of Limelight, we organised a fun company event to take place during work time. 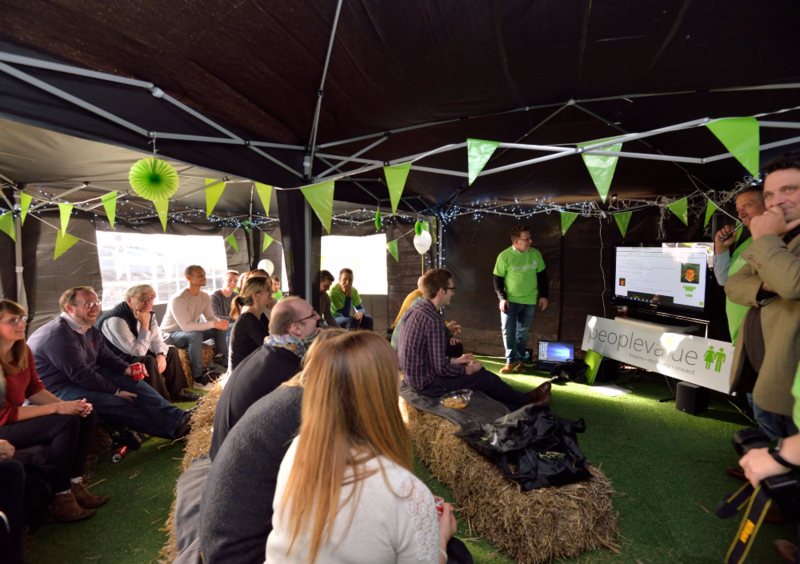 Taking place on a hot summer’s day, we set up a large marquee outside our Wheatley office and kitted it out with hay bales, bunting, balloons and lights to create a nice relaxed atmosphere for everyone to enjoy. Our CEO and Managing Director kicked off the celebration by presenting our values and the story behind them, explaining why they are such an important addition to our company. After that, we all came together to celebrate. 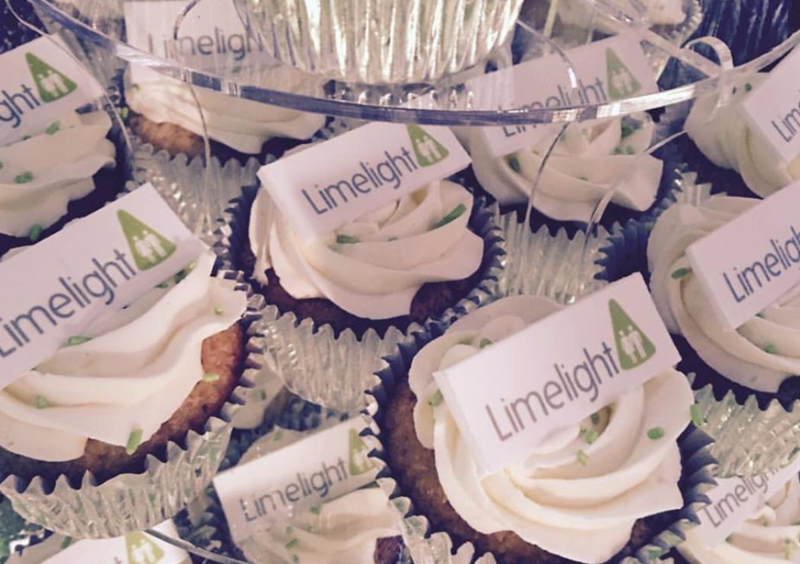 Everything was branded to our Limelight reward and recognition scheme including t-shirts, balloons and cupcakes! 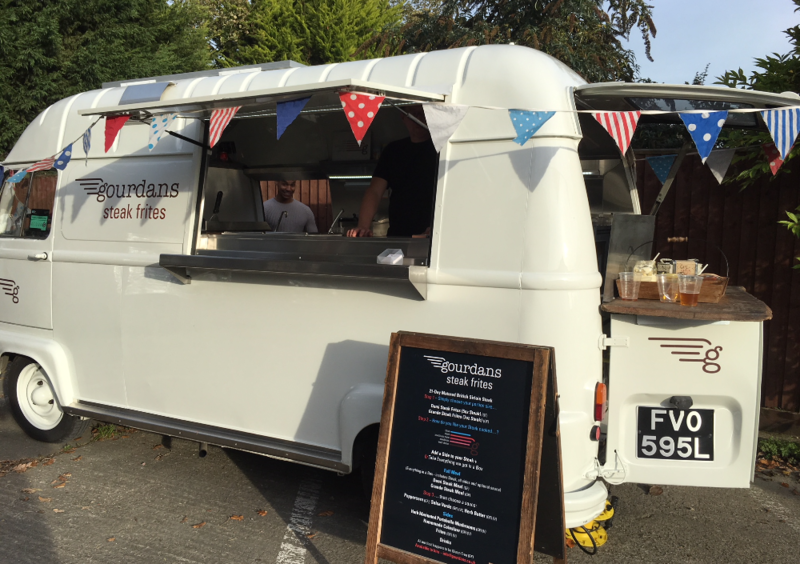 We also supplied everyone with refreshments and there was mobile catering from a steak frite van that came on site. STEP 4 – Next steps? Now with our values visible on our website and Limelight an established element of our business, our next step is ongoing – to continue to live our values. Everyone at peoplevalue knows and understands our values, and we all work individually and together to reflect these values in our different roles. Whenever anyone displays one of our values, we recognise them too, through Limelight. Having our reward and recognition scheme completely focused around our values means that they are fully embedded into our culture and we all actively reinforce and encourage the different behaviours aligned to our values. To find out more about our values and who we are, click here. If you’d like to find out how to align your values to a reward and recognition scheme, find out about our ereward solution.